Pamela Armstrong's second collection of free verse poetry is a more wide-ranging exploration of the levels of awareness we may gain as we layer on new life experiences, reflect on where we came from, and continue to clear a path to a future guided by the higher self. A collection of poems in free verse, created by a psychologist sharing insights gained, both personally and in the therapy room, during the course of a long career. The poems relate to conversations that can go on inside a person, between people, and in the wider world. The collection is divided into eight sections with the following titles: Artistic Expression and the Creative Process; Growing Up and Getting Over It; Generations; Stalled in the Fast Lane; The Healing Power of Nature; The Mixed Blessing of Closeness; Letting Go; and The Greater Good. On first read I felt as though this author could see into my soul... into everything I was thinking and feeling. Now as I read it again, I can see the pearls of wisdom sewn into every thread of the fabric that is this book. Free verse was new to me and took some getting used to, but the messages are powerful and timeless for every stage of life. 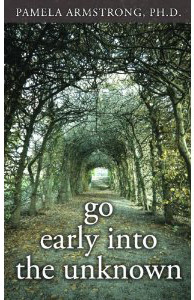 Pamela Armstrong's first book of poetry, go early into the unknown, is a courageous free-verse mapping of trails leading to the discovery of new territories in the Self. The book is her report on an expedition into poetic expression. Trained as a psychologist, Pamela blends her behavioral scientist self with her newly discovered poet self during her no-nonsense searches and reflections. This collection of poems celebrates the potential of the creative process at all stages in one's life. This is one of the most insightful books I have ever read. It is packed with vignettes of wisdom and inspiration. I loved reading and rereading this little book and consider it one of the best contemporary books of poetry in my library.